When I was younger, I was always looking for ways to help out with the cooking. And when I mean help out with the cooking, I mean preparing white rice with soy sauce or fried pirogies with onions, mushrooms, and tomatoes for my sister and myself as an after-school snack, or boxed cake, muffins, or loaves, the kind where you add flour, water, and an egg. This was the extent of my expertise. During the hot summer months, when it was too hot to cook inside, we would often barbecue. Burgers, hot dogs, steak, potatoes, corn, and veggies were all of my favorites. As a way to help out, I loved to make the salad. I always gravitated towards the same ingredients - iceberg lettuce, carrots, tomatoes, mushrooms, celery, boiled egg, and cheddar cheese. I would carefully bring out all 10 bottles of the various Kraft dressings we had lined on the fridge door (Italian, Ranch, Catalina, 1000 Island etc). Sometimes I would go for Italian, but mostly I was a Ranch girl. Towards the end of high school, I remember moving away from our traditional salad and in the direction of more exotic salads, like the ever so popular salad of the late 90's involving spinach, dried cranberries, and goat cheese. I remember thinking, how exciting, dried cranberries in a salad! This is right around the time that people started thinking less of salads as an appetizer rather more of a main meal with the addition of protein. Back then, I never would have thought to make a salad with fruit as the main ingredient, but today, a salad doesn't seem a salad without some sort of fruit. When peaches are in season, I try to use them in cooking whenever I can. They are so incredibly juicy and sweet during the summer months, I just can't help myself from buying a few pounds every week. I think the key to pulling off a salad with lots of fruit is by adding some sort of cheese, a bold lettuce, and an acidic dressing. 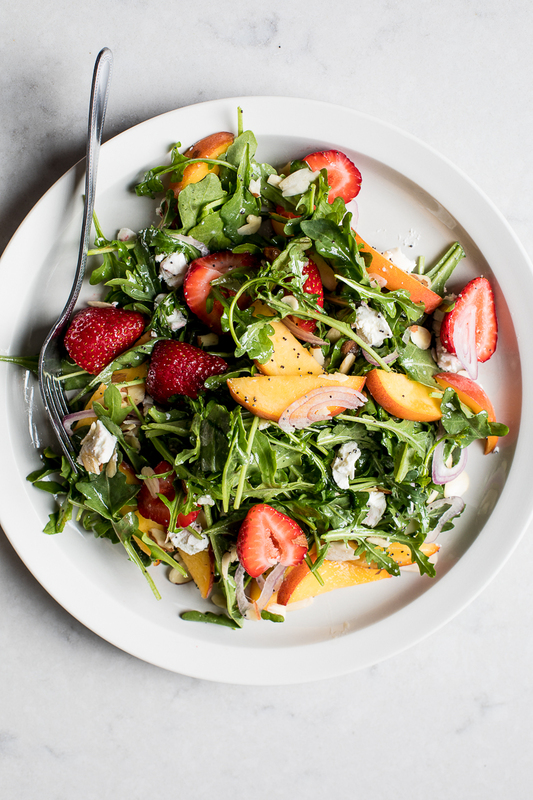 Arugula works well in salads with fruit because of its peppery flavor. I could eat this salad every day for the rest of the summer! Add all of the dressing ingredients to a jar with a tight-fitting lid. Shake to combine. 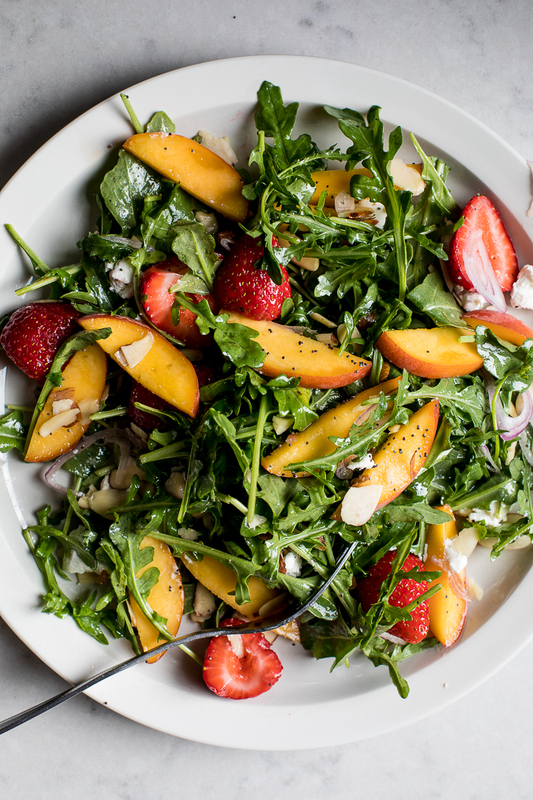 In a large bowl, toss the arugula, strawberries, peaches, and shallots with enough dressing to coat. You will most likely have leftover dressing to store in the fridge for another day. Plate the salad, and then top with the sliced almonds and goat cheese. Season with salt and pepper. Serve and enjoy!